Since the weather has been getting nicer, the garage sales are popping up all over the place, and I cannot resist to go to ALL OF THEM. 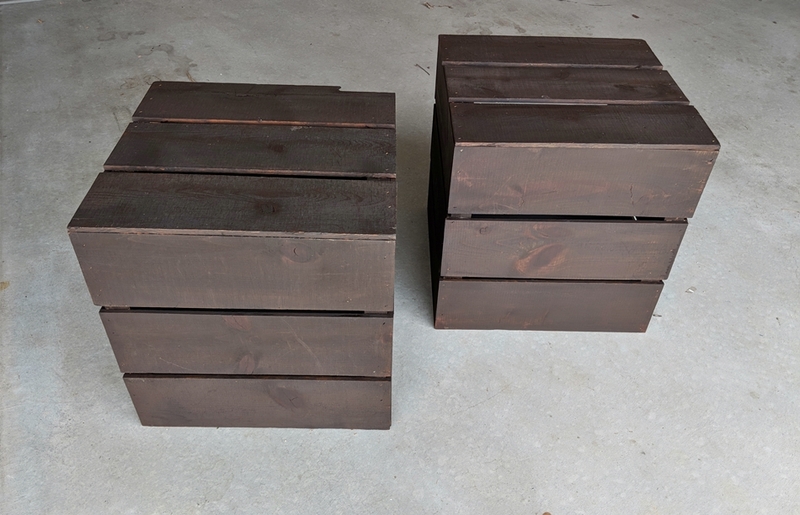 A few weeks back I found these wooden crates for $5 each. They were sturdy and in pretty good shape. I walked past them several times before deciding that I would kick myself later if I didn’t get them. 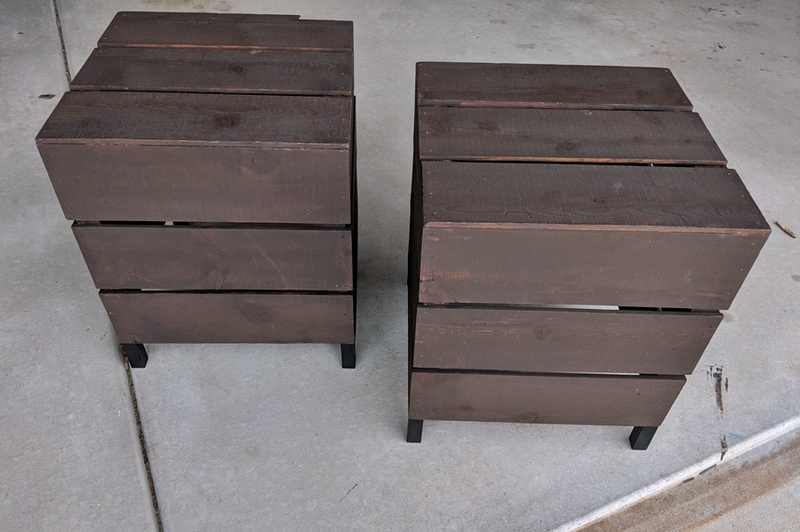 I think they were meant as crates, maybe to go on your porch with a big planter in them or something, but I decided to turn them over and use them as side tables. I liked these because I thought I could get them to kind of match the bed that has sort of the same wooden slat type headboard and black, square frame. 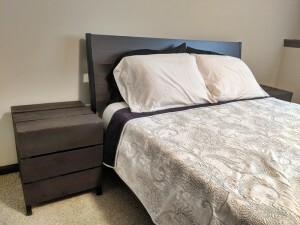 It wasn’t until I got them home and had already made my revamp plans that I noticed one of them has a small chunk missing from the top corner. Oh well. I stained them with a dark chestnut stain I had laying around. 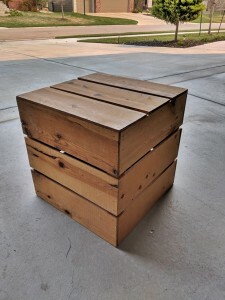 I wanted to add some small legs to them to give them a bit more height, but because of the way the crates are constructed, my options of legs and ways to attach them was quite limited. I ended up getting a 1″x36″ (I think, I don’t actually remember the length) rod from Lowe’s to use for the legs. 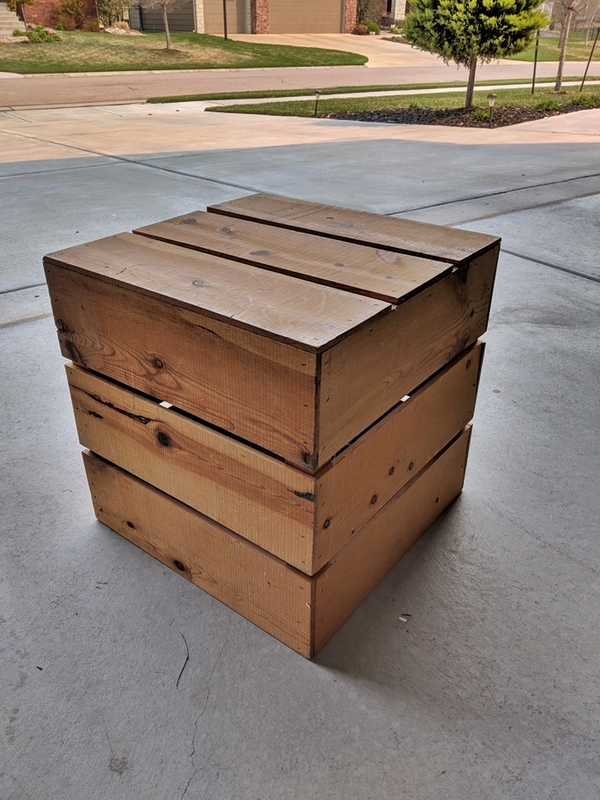 My brother-in-law was nice enough to cut it into eight 3″ pieces for me, since I don’t own a saw. 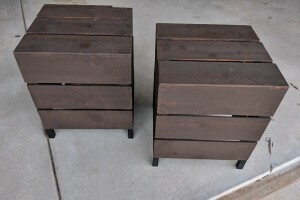 I sanded them and got rid of the rough edges left from the cutting, and then spray painted them black. 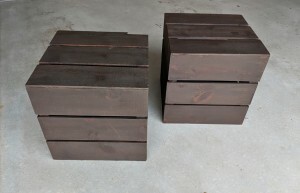 My plan was to use epoxy to attach them to the corners on the underside of the crates. There was some concern that the epoxy wouldn’t hold up for this use and that the tweedley little legs would snap of if bumped at all. I let them set for a day or so. So far so good. I scooted them a bit to test out the strength of the legs, and to my relief, they stayed where they were supposed to. Hoorah! 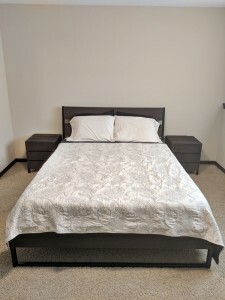 I figure since they’re going down in a guest bedroom that doesn’t get a lot of use that they should be alright. As long as none of our guests attempt to scoot them around on the carpet floor, they should be fine.